Though this shape is really a Y-necklace, you will also find it referred to as a lariat. 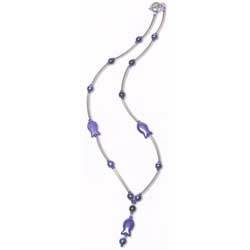 Our Lariat Jewellery article elaborates more about each. Here are an illustration to create a Y-lariat necklace using a single strand or wire or thread. 1) Cut a lenght of your stringing material. Allow a generous length for your drop (at least twice the length of your drop). 2) Bead a small, strong bead into the middle. Then with the 2 thread ends together, double-thead through the beads you want for the central drop. The initial small bead will hold the other beads in place. 3) Separate the threads into single strands when you are happy with your drop-beads. Thread beads on each side to create the rest of your necklace according to the look and design you have chosen. 4) Finish off your piece with the fastener of your choice.